Most prescriptions can be filled in our office, at a price competitive to other sources. Soon you will be able to purchase directly through our website. Until that time, for your convenience, please call 24 hours before picking up so we can have your script ready for you. This prevents waiting if you arrive at a busy time or during surgery or treatments. 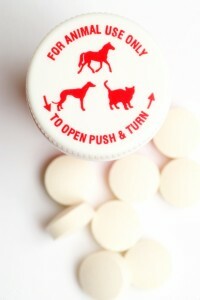 For a small fee, we can also mail your pet’s medication. A word about internet pharmacies Due to the ongoing concerns regarding the authenticity of medications sold by internet pharmacies and pet stores, we do not recommend using these pharmacies. We encourage you to buy from us, so we can ensure your pet’s safety. We price our products competitively, and frequently find that our price is lower than the ‘deals’ offered online. We will be glad to review offers you have found, and will at least meet them whenever possible. However, sometimes we just cannot compete with the buying power of the big Internet companies. If you find a significant price difference on a medication that is the right one for your pet and still desire to buy it online, a doctor will write the prescription, provided your pet has been examined at our hospital within the last year. When making your decision, please remember that we offer a well trained staff, the manufacturer’s guarantee, and personal concern for your pet.